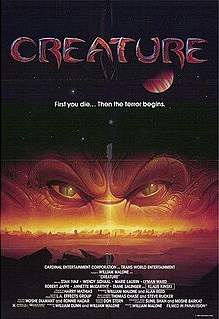 Let’s be clear: William Malone’s (who also directed the very entertaining reboot of The House On Haunted Hill, among an extensive filmography) 1985 movie Creature is essentially a low-budget knock-off of Alien, down to the monster itself (when you could see it in its entirely that is, which wasn’t often). It’s also not a very good movie, though by no means irredeemably so. The premise involves two companies, the West German Richter Industries and the American NTI, which were working to profit from space exploration and exploiting whatever they happened to find. The movie, despite taking place in the future, didn’t take into account the possibility of the fall of the Berlin Wall, which divided East from West Germany, five years later. What it also doesn’t seem too cognizant of is the nature of corporations, which when they get large enough become almost stateless, borderless entities. In any case, in caverns beneath the surface of Titan, Richter Industries operatives discover canisters that contain beings that are not quite human, the bulk of which are broken, and the occupants dead. Though one wasn’t, and seems to have been in stasis. Due to some meddling (the cylinder that the alien was in was remarkably fragile, considering that its been sitting in a cavern for so long) the cylinder is cracked, and the creature escapes, killing whichever humans it finds. Though there’s a problem, which is that the movie posits that the things in the cylinders were brought there by some being that was gathering a menagerie of alien creatures–which is a cool idea the movie abandons pretty early–though it implies that the creature isn’t from Titan. The reason that that is relevant is because the atmosphere of Titan is toxic, and since the likelihood is that the monster isn’t from there, there’s no reason that it should be able to breathe the atmosphere (which it does). The movie could have used the fact that the creature isn’t native to Titan to its advantage, by having the alien “piggyback” on a human, in an effort to escape its prison. As I said, it’s a cool idea, which the movie throws away. Realizing that Richter Industries must have discovered something on Titan, NTI quickly dispatches a mission there as well. This is where things become way too similar to some much better movies, though the worse of it is is that it didn’t have to be. For instance, NTI also included a security officer among their crew, though didn’t do anything to differentiate her–other than constantly being seen in proximity to guns–from anyone else. If the movie had went into what her capabilities were, what made her so special it would have been an interesting subplot that would have helped to differentiate the movie from Alien more. Though the main story could have revolved around an alien artifact–instead of an alien–that caused the crew to kill each other by making them experience their worst fears. The effect of the artifact would increase the longer anyone was exposed to its influence, which would mean that the Richter Industries crew essentially killed themselves, while the crew of the NTI mission would begin feeling it’s baneful effects the longer they stayed on Titan. Sure, it would change the nature of the movie in some very crucial ways, though I think that it would have also made it more gripping, as well as interesting. Though most importantly it would make the movie feel more original, by using ideas not present in Alien, which would be a good thing. Posted in horror, The Unnecessary Remake Dept..Tagged Alien, NTI, Richter Industries, The House on Haunted Hill, William Malone.